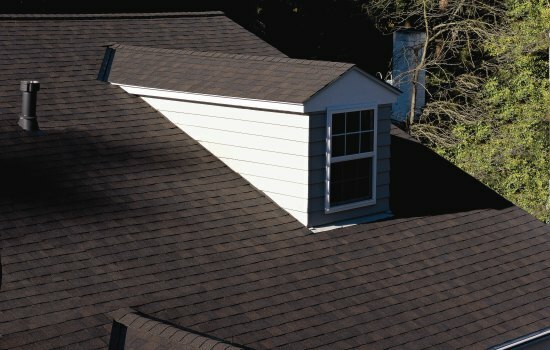 When it comes time for a roof replacement in Rochester NY, roofing ventilation may not always be a the forefront of your priority list; with more emphasis on details like shingle color choice, drip edge metal, roof decking and roof flashings- adequate roofing ventilation is all too often overlooked. What good is a new lifetime roofing system if the shingles and roof decking fail prematurely from a lack of a properly balanced attic ventilation system. Most ice dams and winter roof leaks can also be associated with improper roofing ventilation and attic insulation, not improper roofing installations. When we discuss roofing ventilation with our clients there are 5 frequently asked questions that seem to be common inquiries. 1- Why do I need attic and roof ventilation? A properly balanced roofing ventilation system will reduce heat build up in your attic and roof decking in the summer, moisture during the winter and help prevent ice damming during heavy Rochester NY snow storms. All of these processes help prolong the life of your new roof, roof decking and rafters; as well as increasing the comfort levels in your home and decreasing utility bills. While it may appear that the removal of summer time heat is the biggest advantage, it is actually the control of water vapor in the winter months that will prevent mold, rot and a decreased r value in attic insulation. 2- how much roofing ventilation do I need? The starting point for any proper roofing ventilation system is to measure the length and width of the attic floor and figure the square footage of the floor. The code minimum for adequate roofing ventilation is: 1 sq ft of net free area of venting for every 150 sq ft of floor space. In the opinion of Ron Ferris and Son Roofing this formula is acceptable unless you have a roof with a greater pitch that may cause the volume of attic air that needs to be ventilated. 3- what is the proper way to ventilate a roof? A properly flowing roof ventilation system should have an Intake and Exhaust. What this means is that an equal amount of net free area should be installed in the soffits/ overhangs at the roofs lowest bottom edge as an intake and again at the roofs peak with roofing vents. This allows dry, cool air to enter the attic space at its lowest point and push any warm, moist air out through the roof vents. A truly proper system will have a balance of 50% intake and 50% exhaust. 4- The more roof vents I install is better, right? While it is okay to exceed the recommended amounts of net free area of ventilation, it is never okay to use or mix more than one type of roof vent. This can cause a short circuit of sorts in your ventilation system. Airflow is meant to follow the path of least resistance from the bottom of the roof edge to the roof peak and out. When you combine different types of exhaust venting and place them at various heights on the roof line they will actually work against each other and exhaust vents can begin to function as intake vents pulling in hot air from the roof line and trapping warm, moist air in your home. Intake vents however are okay to combine various forms of venting. 5- How do I vent my house if it has different height peaks everywhere? While it is okay to vent multiple peaks that run parallel or at angles with each other, the rule for peaks of different heights is; any peaks or ridges more than 3 feet apart, than only the highest peak is to be vented. The reason for this is the same as installing multiple types of roof vents at different heights. The higher elevated vents will begin to pull air in through the lower vents instead of exhausting it. It is best to seperate attic spaces with plywood or plastic sheeting to create different distinct areas to be vented. If you have any additional questions about incorporating proper roofing ventilation in your new roof in Monroe County or Wayne County, contact our owner today. He will personally meet with you and discuss a plan that will meet your individual needs and budget. Call us today @ 585-288-0895 and schedule your free roofing estimate! If you currently have or plan on installing a flat roof or low slope roof in Rochester NY you may require various roofing services and maintenance during it’s lifetime that a pitch roof will not. The importance of first finding a roofing contractor that is experienced and certified in low slope installations is above all else. The highest quality flat roofing materials are meaningless if improperly installed. Make sure the roofing company you choose can provide you with referrals of other flat roof owners they have helped. Do not be fooled by a less qualified roofer who may try to convince you that it is okay to install roofing shingles on a low slope roof if you apply an ice and water barrier underneath the shingles. This is wrong! Roofing shingles and underlayments are designed and manufactured to “shed” water which requires some pitch. They are not designed to hold out “pooling” water. In a situation with little to no slope(flat) water will pond and seep back under the shingles and cause damage to your home’s interior. This problem will only be amplified when winter sets in and ice damming occurs. To properly shed water from a flat or low slope roof a top sheet needs to be applied with some form of adhesive or hot tar rather than fasteners so that “ponding” water can be directed to a roof drain or rain gutters and not get under the top sheet of roofing material. A proper base or mid ply must be adhered directly to an acceptable roof deck in order to provide REAL long term protection and comply with warranty standards. Maintenance is of the up most importance when it comes to flat or low slope roofs. Keeping drains and gutters free of debris like sticks and leaves could mean the difference between years of headache free protection and a serious leak that could have easily been avoided. Most roofing companies offer roof maintenance programs which include cleaning roof drains and inspecting any roof flashing, caulking or seams in the flat roofing material. A well maintained low slope roof will last years longer than a neglected one. It may be possible to repair your existing flat roof but that will depend greatly upon the age of the roof and the specific materials that were used in the original installation. If your flat roof is aging but still have some life to go, a flat roof restoration may be possible. An elastomeric, fiberized aluminum coating is applied to the entire roof surface to restore your flat roof to a newer state. Tis option is faster, easier and cheaper than a full roof replacement but fails to uncover potential leaks or damage in roof decking and flashing. All low slope roofs from residential to commercial will eventually require roofing service to either repair or replace the roof. Performing small repairs and regular maintenance are the key to making a quality low slope roofing system stand the test of time. Above all else is the importance of hiring a reputable roofing company that specializing in flat roofing, is properly insured to perform roofing and has a longstanding record of quality roofing installations backed by superior customer service should any problem or defect ever arise. Give our owner a call today to learn more about roofing in Rochester NY @ 585-288-0895 or request your roof replacement estimate online! We have noticed a disturbing trend the last few roofing seasons at Ron Ferris and Son Roofing. More and more each year we receive calls for roofing estimates from homeowners who’s insurance companies have demanded they replace their roof. If they don’t they are informed that any further claims against their roof will be denied or that their policy will be terminated completely. Reasons can range from shingle condition, algae and moss formation on roofing shingles and even the type of (or amount of layers of) roofing on your home. Today we will discuss a type of roofing that seems to be the latest target; cedar shake roofing! Cedar shake roof‘s are beautiful, they have a look that can give your home a character unparalleled by asphalt roofing shingles. A cedar shake roof not only looks great but will also allow your home to breathe and help insulate your attic. Despite these attributes, cedar shake roofs have many issues; these issues have become so large and commonplace across the insurance marketplace as a whole that many homeowners insurance companies require the replacement of these roofs in Wayne County. This definitely puts homeowners in a jam as replacing a cedar shake roof with a new asphalt roof will also require the removal of the cedar so an acceptable roofing deck can be installed. This will significantly increase the cost of your roof replacement. The extent of the wear and the level of protection still left in your cedar shake roof can vary greatly based upon your roof pitch, roof ventilation and the grade of cedar used to make the shake shingles. Roofs that face a southward direction get more direct solar radiation and consequently the wood will degrade quicker. The most serious and dangerous issue associated with cedar shingles; is that they are manufactured without being rated by fire safety codes. Most manufacturers use wipe on or spray on fire retardants which offer little to no protection from the start and none if not re applied periodically. Embers traveling from a house fire down the street can ignite a fire on a cedar shake roof a good distance away. There are many factors to consider about roofing Rochester NY; from shingles, waterproofing barriers, shingle accessories, roof ventilation, pipe boots and roof flashing. Each of these factors play a crucial part in protecting your home or business from the worst of Rochester weather. When installed properly, a new roof in Rochester NY should be able to withstand heat, wind and water from damaging your property. For decades roofers in Monroe county have been installing felt paper as a water resistant(not water proof) underlayment for their asphalt roofing shingles. Today we will discuss the differences and advantages of both asphalt felt paper and synthetic felt underlayments. When choosing your roofing underlayment a lot of factors can come into play such as roof pitch, budget and overall personal preference. Not every roof requires the best underlayments available. For instance a standard shingle roof does not require the same level of vapor barrier protection as a new metal roof would. If you are on a tight budget a 30lb asphalt felt will be an adequate vapor barrier for asphalt shingles. Remember felt(asphalt or synthetic) is water resistant not waterproof which means neither will hold out water long term as they are not self sealing- our long term goal is vapor barrier protection. – comes in 15lb and 30lb saturation weights. As you can see the advantages of synthetic felt far outweigh traditional felt paper. Felt is essentially asphalt saturated paper; the amount of asphalt used determines the water resistance of the felt paper. Synthetic felts are artificially manufactured materials like polypropylene, fiberglass, polyethylene and polyester, they make a much more efficient water barrier that will last longer than traditional felt because the chemical compositions for synthetic materials are more stable against weathering. This same efficiency in preventing water and vapor damage can cost more to manufacture and refine and generally costs more which is why most roofing contractors in Rochester NY will charge you to “upgrade” to a synthetic underlayment. When performing a roof replacement in Rochester NY one of the most overlooked aspects of a new roofing system is the roofing drip edge metal. Drip edge metal is a pre bent aluminum roof flashing that comes in 10 ft lengths and is installed on your roofing rake and eave edges. It is meant to help control the flow of water away from your fascia boards, outside edge trim and roofing components. While drip edge makes your new roof look more complete and actually protects your home; some roofers in Monroe and Wayne county do not use new drip edge metal because it’s use is not mandatory when adhering to local building codes. As one of Rochester NY’s best roofing companies, we install new drip edge metal on all re roofs, roofing tear offs and flat roofs. What if your roofer says you don’t need new drip edge metal on your new roof? Then maybe you need to reconsider the roofing contractor’s integrity for quality roofing installations. They may tell you that a large majority of homes have been built and re roofed with no drip edge metal and that it is a waste of money? Is it a waste of money to take the proper steps to insure your biggest investment is protected? Do you want to purchase a lifetime roofing system only to have your fascia and roof decking rot at the eaves and rakes? Of course not! Though roofing drip edge metal is often overlooked by most roofers, it is a simple solution that can solve these problems easily and should definitely be included in your new roof. Make sure this is an itemized part of your free roofing estimate when accepting bids from roofing service providers. For more information on drip edge metal call us today at 585-288-0895 or visit us online to schedule a free no obligation estimate. Ice dams prevent water from flowing off the roof. The melt water will instead “pool” behind the ice dams. Water can then seep under shingles, through shingle fastener holes, roof decking seams or roof penetrations and into your home or business. No residential roofing system or ice and water underlayment can stop the intrusion of pooling water as roofing shingles are designed only to shed water. 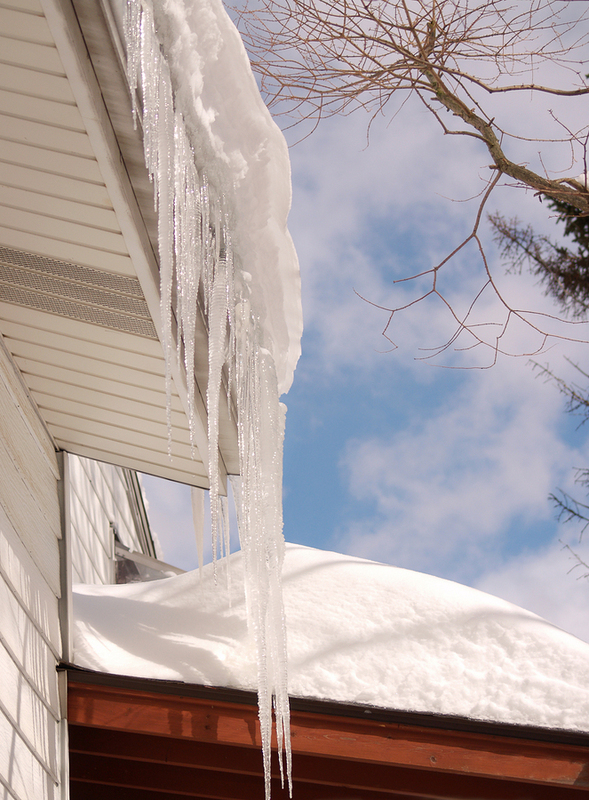 These ice dams can cause significant damage to your home’s roof decking, rafters, insulation and finished ceilings, not to mention mold! in addition heavy ice build up can result in gutters being damaged or torn down from the weight of the ice. To avoid ice dams the entire roof surface should be cleared of any accumulating snow and ice by a trained roofing professional. Ice dam removal in Rochester NY is a very dangerous job that can also cause great damage to your home’s roof,siding and gutters if not performed properly. However Rochester NY winters can be relentless and hiring a roofing contractor to keep clearing the roof can be impractical and simply unaffordable. In these cases roof deicing cables can provide a reasonable solution to your ice dam problems. Placing deicing cables on roof edges, valleys, gutters and downspouts will prevent this ” melt” water from re freezing. This allows water to have a clear path to be shed from your roof system and safely into gutters and away from your home, preventing damage to your home’s interior and roofing gutter system. In general the deicing cable should be installed on areas of the roof where ice dams are likely to form. This may be hard to determine based upon such factors as exposure to the sun, prevailing wind direction and roof shape. The susceptible area may be an entire roof edge or may just be a concentrated area like below a skylight, roof dormer or in a valley. As it is hard to determine exactly where to install deicing cables it is likely you will require the assistance of a roofing company in Rochester NY. Roof and gutter deicing cables are not intended to and will not melt through snow and ice that is already formed on a roof and gutters. This product is not designed to melt through the top of heavy snow and ice, its function is to provide a path for “melt” water from above that has already melted to flow to the ground. Do not wait to call a professional roofer until winter as they will not be able to properly install the deicing cable or positioning clips. To learn more about roofing snow and ice dam removal in Rochester NY or deicing cables contact Ron Ferris and Son Roofing today at 585-288-0895 or visit our roofing services page at ronferrisandsonroofing.com. 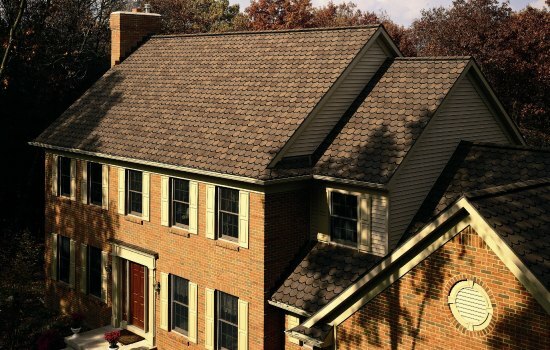 When considering options for your roof replacement in Wayne county NY, choose the number one choice of residential homeowners in America… The designer series shingle from CertainTeed. This durable, beautiful color blended line of shingles has the widest aray of colors to suit any home’s exterior. This two piece laminated fiber glass based roofing shingle has a per square weight of 240lbs. Which is heavier than any competitor’s designer series shingle. It carries a class A fire resistance and is manufactured with a self sealing adhesive strip and reinforced nailing zone for increased wind resistance. CertainTeed warrants that its shingles will be free of manufacturing defects and provide the extra assurance of SureStart protection…. A lifetime limited transferable warranty. As well as a 10 year StreakFighter warranty against black streaking and discoloration caused by airborne algae and a 15 year 110 mph wind resistance warranty. Wind warranty upgrade is available up to 130 mph with the use of CertainTeed SureStart starter strip and Hip and Ridge accessory shingles. Applying a new roof in Wayne county correctly and in accordance with warranty standards is essential to performance and warranty of your roof replacement. Backed by over 100 years of excellence in the roofing industry, Certainteed has developed a comprehensive training and testing program to ensure their products are installed as a complete high performance system. A certified Shingle Master accredited company like Ron Ferris and Son Roofing is recommended to ensure the highest quality installation standards are in practice. To learn more about CertainTeed’s residential roofing options or to request a free roofing estimate in Wayne county call the pros at Ron Ferris and Son at 315-524-8924 or check out our roofing services page!